The sign on the door says that the Winchester Club is officially open. We choose who comes in. Probably the first rule will be that no one moans about cigar smoking. Cigars and ash trays will be provided. I don't smoke them, but that's not the point. "So it is finally opening above my garage." 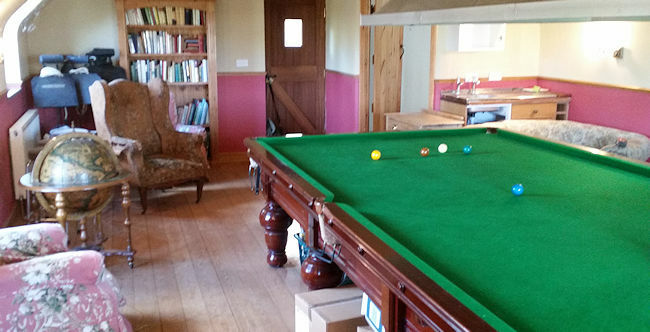 The snooker table is there and all is set. We can only get about 10 or so people up there while snooker is going on, so it'll be an invite thing to start with. The only stipulation is that guests can tell jokes and everyone present will have to tell one on their first visit. Guests and members will be required to bring a donation of alcohol and that's about it at present. It's open to any men and women and we may do charity snooker events later to raise a bit of money. Men will be referred to as Brother and women as Sister which sort of ties up with the Free Masons and Socialist revolutionaries with a bit of C of E thrown in. We are non-judgemental. It will run on Monday nights as that's when the Robin Hood pub down the road is closed. PK and I are planning the opening night as we speak. It's really just a joke telling place where people can smoke, drink and fart without any miseries telling them what to do and I think will be a huge success. Oh, and of course, for those of you too young to remember, it's named after the club from the tv series 'Minder'. Anyone who looks like Arthur Daley, Terry McCann or Detective Sgt Chisholm will receive preferential treatment. "I shall be Dave the barman of course." We will resurrect the art of joke telling and ... well ... we'll just have some fun. It's a sort of new style of networking. I'll keep you posted.